Backed by an ingenious Swedish design, the Stainless Steel Chopper from Alligator is here to make food prep quick and easy! This simple-to-use gadget features a stylish stainless steel construction and comes with three interchangeable grid-like knife sets that includes a standard-sized set for onions, a large blade set for thicker items like French fries and an extra-small blade set for finely-chopped garlic. Whatever your ingredient of choice, this Stainless Steel Chopper cuts through all types of foods with one swift motion. Includes three interchangeable grid-like knife sets. 6mm x 6mm set is designed for chopping onions, tomatoes and more. 12mm x 12mm set is perfect for thicker foods like French fries. 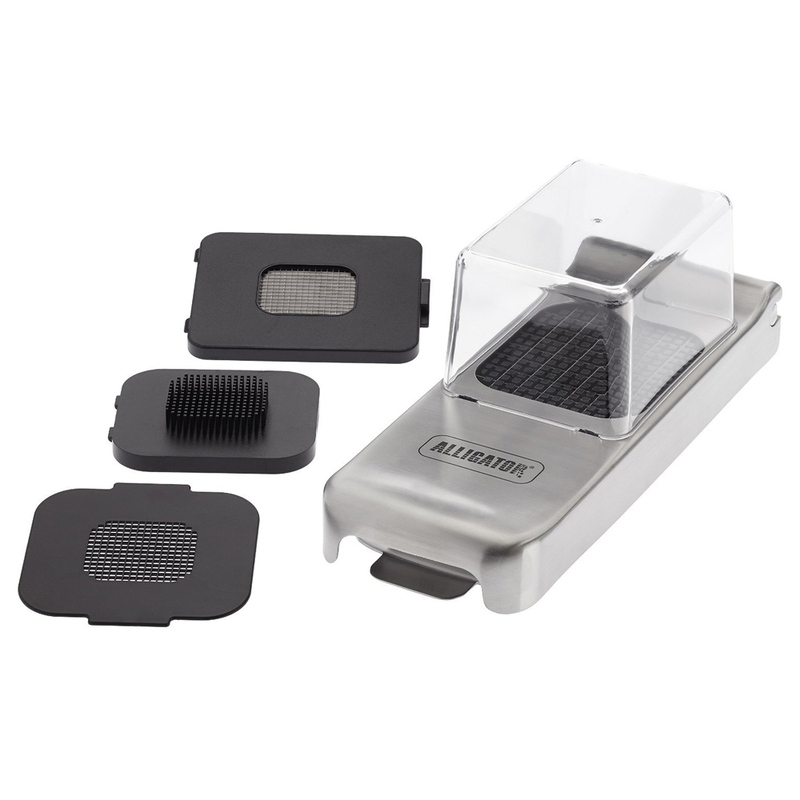 3mm x 3mm blade set is perfect for finely chopping foods such as garlic. Cuts through all types of foods in one swift motion. Clear collector tub catches all of your chopped ingredients. Grid along the base of the chopper comes off for easy cleaning. Hand wash only for the grid. Blade sets are dishwasher safe. Presented in an Alligator box. Box Dimensions: 29cm (l) x 12.7cm (h) x 11cm (w).